At Steel Advantage® our Window Guards are the ‘hallmark in quality and value’ in the southwest market. The Steel Advantage associate responsible for your product(s) represents a highly experience staff of craftsman and installation technicians, bringing you the highest quality products backed by the strongest and longest warranties in the industry. 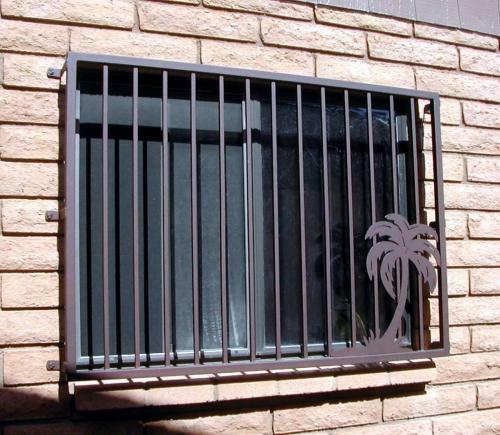 Each individual totally custom window guard is hand crafted right here in the valley by our factory trained artisans, using steel produced 100% in the USA. At Steel Advantage you will always be dealing with company employees, never a sub-contractor. Protect your home and family with security window guards today. Our ‘Home Protection Warranty’ is included automatically with every window guard we build and install, offering you the safety and security your family or business deserves. Call us today at 602-710-2913 or use our online estimate request form, and we’ll get back to you by phone or email. (your choice) You’ll be glad you did. At Steel Advantage we boast a 100% Customer Satisfaction rating as determined by an outside, third party auditor. We also offer our Best Price Guarantee. We offer complete service – valley wide. Free installation and delivery are included with every local Window Guard purchase. 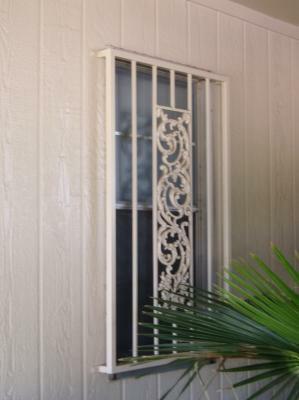 All Guards are custom built and fitted to your opening. All Guards are heavy duty 16 gauge steel construction. All Guards are mounted with “One way” screws additional security. Hinges are welded on operable guards. All Guards are built to Fire Code whenever necessary by law. This may require an optional fire release. There are many styles available: Fully Framed, Railroad, door matching designs, custom designs, Old World designs, and so on. You can also add many of our add on designs to customize on your own. Stationary guards are affixed around the outside of window opening with standard 2 ½” standoff brackets (standoff brackets can be made longer or shorter for special applications) and generally have four anchor points (one in each corner). Stationary guards wider than 84” or taller than 60” will receive an extra anchor point in the center. Pushbutton release : Guards with a pushbutton release must mount on the outside of the window and must have a 2 ½” standoff. There will be a ½” hole drilled through the wall next to the window on the operable side of the guard. The button will be mounted inside the home next to the window. The thickest wall we will drill through is 24”. All operable guards wider than 72” will need to be hinged in the center and will open on one side only, with an extra anchor point top and bottom by the hinge to support the weight and functionality of the guard. This can cause problems when mounting castings or laser designs in the guard that need to be evenly spaced. Lock Box Release : Lock box release guards have a double cylinder deadbolt and require a key from either side to open them. Guards with a lock box release generally mount on the outside of the window with a 2 ½” standoff Guards can be placed inside the opening on the outside of the home to create a flush mount look (this is not standard practice, cannot be done on all window openings, and will be an extra charge). All operable guards wider than 72” will need to be hinged in the center, and open on one side only, with an extra anchor point top and bottom by the hinge to support the weight and functionality of the guard. This can cause problems when mounting castings or laser designs in the guard that need to be evenly spaced. Kwikset double cylinder deadbolt is included. No other brand locks are available. This is a dry paint process, cured in an oven, which offers excellent resistance to corrosion, heat, impact, abrasion and fading from extreme sunlight and extreme weather conditions. There are many different powder coat colors available.